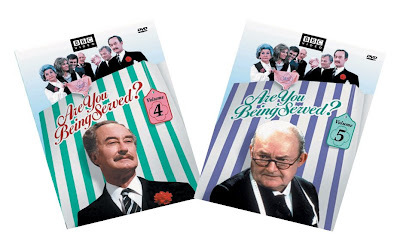 From the Archive: A British Television Blog: An Are You Being Served? Christmas! As a writing exercise, it is important to me to keep up this blog. I want to document my thoughts on the programs I watch and enjoy. I know not that many people view this blog and of the people who visit, I am not sure how many people actually read it. I just want to practice writing and trying to formulate some thought on what I am viewing every week. It is a kind of experiment for me. Why am I going into such detail? Because I am sick. I have a high temperature and am achy all over. It’s Christmas Eve and probably will not have a chance to write up about last week’s viewing especially as I plan to write up a review of The Next Doctor over the next couple of days. So this will be short. Yay! After a couple of weeks of watching pseudo Christmas episodes of programs I randomly pciked, this week I watched two bona fide Christmas editions of Are You Being Served? : Christmas Crackers and The Father Christmas Affair. Just like mentioned in last week’s article on Keeping Up Appearances, all of the Christmas specials for Are You Being Served? were taken out of the episode syndication package with the rest of the series and held separately generally only available for December viewing. I could imagine that these episodes could have been really exciting for regular viewers in 1975 and 1976 respectively since they aired so long after the previous series ended. It would have made it feel really special. For Christmas Crackers, Series 3 ended in April of 1975 and The Father Christmas Affair would have aired after Series 4 would have finished broadcasting in May of 1976. So there was a sizable gap between regular series and specials. Christmas Crackers starts off as a meeting with the Grace Brother staff trying to figure out how to get more people into the store over Christmas. It was soon discovered that Young Mr. Grace decided the staff will dress up in Christmas style costumes and serve the customers this way. Apart from a slight interlude with a Christmas lunch that goes horribly wrong in the canteen, the whole episode ends in song. One thing that really stuck out at me while watching this was that the timing in the episode was off by some of the main cast. Frank Thornton steps on a couple of the other actor’s lines and even jokes. Trevor Bannister does very much the same. The entire rhythm of the episode seemed way off. I am not privy to production dates for Are You Being Served? as I am with other series so I am not sure if this was recorded as part of the third series or was this done closer to its Christmas broadcast. Generally, I have never liked any of the musical numbers in Are You Being Served? I think John Inman, Larry Martyn, Nicholas Smith can carry a tune quite well but trying to understand Arthur Brough is impossible and listening to Wendy Richards is just plain uncomfortable to my poor ears. The biggest cringe-worthy moment of the episode to me is watching poor Trevor Bannister nearly fall down the stairs coming out of the lift in his pirate costume with him only able to use one leg; he nearly looses his balance. You could see the look of horror on his face and you could also hear some gasps from the audience. It is not quite as big of a deal as I make out but it is certainly noticeable. The Father Christmas Affair is much more enjoyable viewing. 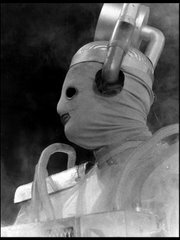 Apart from one of the funniest gags in the series involving a mechanical Father Christmas opening up its arms to reveal it is wearing nothing under it’s cloak while saying “Ho, Ho, Ho little boy, have I got a surprise for you!”, it is just a fun, enjoyable episode. It’s intentionally over the top and silly. Mr. Grainger needs to update his yearly act he gives to the old people’s home. Instead of doing his Winston Churchill impression, Mr. Humphries suggests Grainger tries to mimic the Al Jolson number Mammy including the use of blackface. While this is happening Young Mr. Grace is offering £50 to the person he chooses to play Father Christmas in the store. Since Grainger can’t get the grease paint off his face, he auditions for the Father Christmas role with it on. Luckily for him, Young Mr. Grace brings along a little black boy who immediately identifies with Grainger and thus Grainger gets the role. It’s a fun episode with another musical number of sorts. This time it’s Mr. Humphries and Mr. Lucas trying to teach the very immobile and rigid Mr. Grainger a simple dance routine for the song Mammy. Unlike Christmas Crackers, The Father Christmas Affair doesn’t try to do too much in the episode and lets the story play out and focus more on the characters. This is hardly surprising to me as I find many of the episodes of that series to be superb such as Fifty Years On and Oh, What A Tangled Web. I viewed these episodes from the R1 releases. The quality is much better than the copies shown on our PBS station. The colors are vibrant and there is not much in the way of tape drop out. There are some but nothing like the copies we had seen here before which were from copies bicycled around the country. I like to generally get any British series as R2 PAL releases as much as possible but I am glad I didn’t with this. The R1 release included a couple of discs of extras plus even more importantly, none of the episodes on these sets are cut in any way. The same can not be said about the R2 releases. Next Week: A Tribute to Producer and Director Bob Spiers who passed away on 12/8. I will be watching some of the programs he worked on including The Comic Strip Presents, It Ain’t Half Hot Mum, Dad’s Army, Come Back Mrs. Noah, Fawlty Towers, (Maybe the Australian version! ), Bottom, and Absolutely Fabulous. I know he has done a lot more work than this but those are the only things I have in my collection that he had any involvement. Coming Soon: I occasionally do pseudo reviews. I call them pseudo because I don’t have any business reviewing anything! I plan on posting reviews for Doctor Who episode, The Next Doctor and the DVD for Doctor Who: Battlefield soon.